What's a nice kettle like you doing on a dirty stovetop like this? 1. A tiered bundt cake pan you could honestly just hang up as wall art because it looks that nice. (Obviously) oven-safe and hand-washing recommended. Get it from Amazon for $30.99 or Food52 for $38. 2. A paring knife set that'll look so ~sharp~ in motion or at rest in their protective sheathes. Includes two 3.5" paring knives, one 3.5" bird's beak knife, and matching blade guards. Made of high-performance carbon steel and ultra-durable pakkawood. Get it from BuzzFeed's Goodful line, exclusively at Macy's for $29.99. 3. A sturdy egg holder for taking good care of the most versatile ingredient in your fridge. Made of stoneware. Microwave-, oven-, and dishwasher-safe. 4. Agate coasters to protect your nice surfaces in an attention-grabbing way, even for the monster you otherwise adore who never uses a coaster. Get them from Amazon for $24.99 (available in five colors). 5. A stunning kettle may just whistle its way into your heart (and kitchen) with its matte black finish and cool-touch handle. I'm actually buying one of these! 6. Or an electric kettle you could even keep at your desk for your mid-afternoon cup of tea. It boils water faster than a microwave and is safer than on a stovetop. It has a 200-watt heating element, fully detachable 360 degree power base with cord storage, and a safe, easy to use design. Get it from Amazon for $29.99+ (available in several sizes and seven patterns). 7. Glitzy flatware to make even the most mundane dinner of spaghetti with jarred sauce feel like a Michelin-starred meal. The four-piece set (including a knife, spoon, fork, and teaspoon) is lead-, cadmium-, phthalate-, and BPA-free. Hand-wash recommended. Get them from Amazon for $21.99 (available in a variety of color combos). 8. A Frank Lloyd Wright tea towel for holding you over 'til you can hang it inside one of his masterpieces you own. 9. A measuring spoon set befitting some in-situ flat lays for all your future holiday baking endeavors. BTW, they're made of stainless steel. Get them from Amazon for $9.95. And check out a similar gold set. 10. A food tiffin and handsome carrier to bring your lovely kitchen looks with you on the go. Has multi-layer insulation to keep your food warm up to 2–3 hours. The carrier is made of felt and has a food-grade aluminum foil-lined interior. 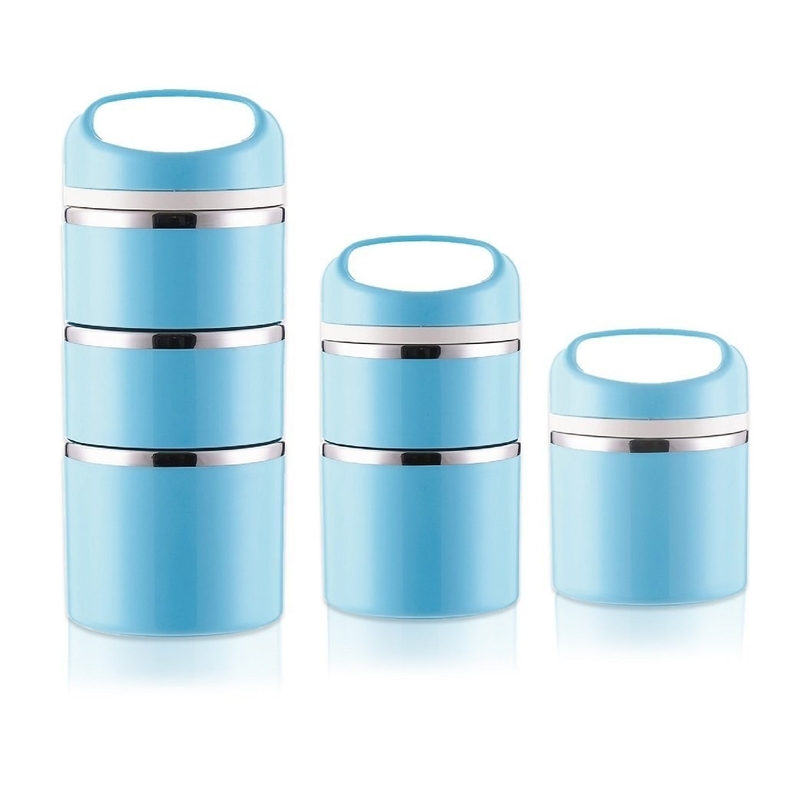 Made of stainless steel, which is naturally BPA-free, and silicone in between the stacking compartments. Get them from Amazon for $26.95+ (available in four color combos). 11. A stoneware cutting board that'll double as a cheese board when you have company. 12. A noodle bowl and chopsticks set to transform a Monday night dinner of packaged ramen. 13. A wine decanter with a perforated aerator for a waterfall effect that'll tempt you to use it every night. I've seen this beaut in action and it's mesmerizing! 14. A stainless steel spoon rest — it could make your countertop look like a gallery. Get it from Amazon for $25.20. 15. Minimalist ceramic grinders that'll become the stars of your kitchen countertop. Get them from Amazon for $52.65+ (available in six color combos). 16. A beautiful trivet — it'll be a beautiful help come Thanksgiving. 17. A mounted pot rack that'll look so nice with one of your house plants parked on the shelf! Oh, and it can help with storage, too. Promising review: "This is a great pot rack!! I got expensive new pans and skillets for Christmas and needed a rack so I wouldn't scratch them by stacking the cabinet. This rack was just the right size. I have 4 large skillets/grill pans, a small skillet, and 2 pans hanging from the rack. I put a 2–3 quart stock pot on the shelf with 2 large lids for the skillets. It looks wonderful! My boyfriend got some nuts, bolts, and washers, and fastened the rack to the side of my cabinet, reinforced on the inside with a 1x2 board. He counter sunk the nuts on the inside of the board, which was screwed to the inside of the cabinet, then we scuffed up the bolt heads and spray painted them matte black. It worked great and the pot rack is VERY secure." —Kim S.
18. A slow juicer to help you cut down on your trips to the neighborhood juice shop and fulfill your pastel kitchen dreams. It has a BPA-free and impact-resistant ABS plastic body, Ultem strainer and auger that's 8x stronger than traditional plastics, and a speed of just 43 revolutions per minute to mimic the motion of hand squeezing juice. Also, its compact size makes it easy to fit on a kitchen counter! Get it from Free People for $299 (also available in white or mint). 19. A gleaming pitcher set for elevating the most basic of beverages like water. Get them from Anthropologie for $58. 20. A marble butter keeper people won't realize serves an actual purpose besides looking lovely 'til you do a demonstration. 21. A beautifully simple coffee dripper to help you make some brew worthy of telling Diane. Get it from Amazon for $44.50+ (available in several colors and sizes). 22. Or a copper French press that'll make you even more pumped about your essential caffeine intake. I've owned this for more than two years and it's wonderful! Also, it's a great option if you prefer to skip a disposable filter because it's built in! Get it from Amazon for $39.84 (available in a variety of sizes and other styles). 23. Silicone drinking straws as an easy-to-clean swap for your plastic ones and a happy alternative if you're not into the stainless-steel variety. Made of BPA-free silicone, and is dishwasher-safe and compatible with tumblers. Get a 10-pack from Amazon for $8.95. 24. A floral carafe ready to hold your brunch concoctions 'til pour time. Get it from Urban Outfitters for $20 (available in three patterns). 25. A shimmery stemless wine glass that'll keep your beverage cool and look good doing it. Get it from Amazon for $24.95 (available in seven designs). 26. A creamy ceramic cookware set ready to help you out in a variety of dishes. Includes 9.5" fry pan, 2 Qt. saucepan with lid, 11" grill pan, 3 Qt. saucepan with lid, 4 Qt. jumbo cooker with lid and helper handle, 6 Qt. Dutch oven with lid, and recipe booklet. Made with heavy-gauge aluminum construction and a titanium ceramic non-stick surface. Eco-friendly, and PFOA- and PTFE-free. And if you're concerned about staining that gorgeous cream finish, invest in some Bar Keepers Friend cleanser and read about why a BuzzFeeder swears by it. Get it from BuzzFeed's Goodful line, exclusively at Macy's for $149.99. 27. Hand-painted wine glasses to give your vino a little extra razzle dazzle. Get them from Anthropologie for $40. 28. 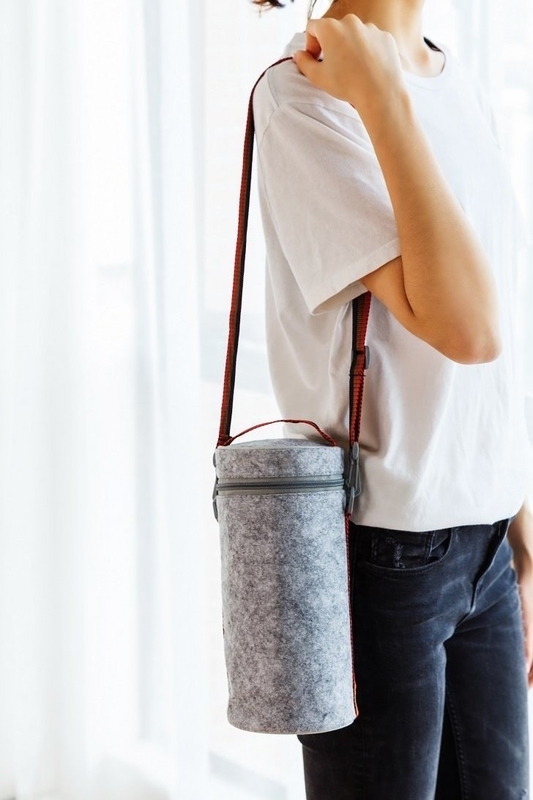 A ridiculously attractive water bottle for carrying on the go or just when you're sitting out the couch with a puppy who tends to knock over regular drinking glasses. 29. Stoneware serving trays to cradle those delish pizza rolls when everyone comes over for movie night. This is from Joanna Gaines's Target line and tbh the whole line is gorgeous! 30. A vegan cookbook — it can look lovely filed away, open on the countertop, and then IRL in your bowl once you make the recipes!!! Get it from Amazon for $15.99+, Free People for $35, a local bookseller on Indiebound, or find a copy at your local library. 31. A Dutch leather oven mitt because safety should always be first and being fancy second. Get it from Food52 for $98 (available in 11 colors). P.S. If you're on the prowl for a Dutch oven like the one in the pic, you can get a 7.25-quart Le Creuset one (a true holy grail) from Amazon for $375.95 (available in 12 colors).